Recently there was a rare occurrence of a car jacking in the State of Utah. In the name of everyday preparedness I thought I’d address this crime, which is actually rampant elsewhere in the nation and thus should be properly addressed to ensure maximum safety of you and your family. 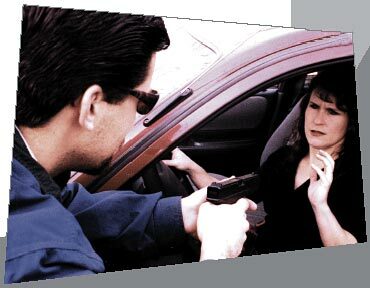 The good news though is that there are several simple ways you can protect yourself from being a carjacking statistic. 1st: Your safety boils down to being aware. You can’t afford to be oblivious. If someone is approaching your car, you need to notice them ahead of time. Make use of your rearview and side mirrors when you are stopped at a light or getting in and out of your car in a parking lot. It’s important that you pay attention to the cars which are parked near you too. Is there someone in the car? Is there anything amiss in YOUR car as you’re getting in it again? 2nd: Never stop at a traffic light or stop sign directly behind another car. While learning to drive in the crazy area of Connecticut, tailgating was virtually a must. But at a stop light or stop sign or even in the midst of a traffic jam, it’s a recipe for disaster. You should always be able to see at least the bumper and the rear wheels of the car in front of you in order to have the ideal safety. At the risk of sounding paranoid, I always give myself an “escape route” when I’m stopped at a light or caught in traffic, even on the freeway. If someone is coming towards my car, the first thing you should do is ensure your doors are locked, your car is in gear, and have your foot on the gas. If you have any doubt as to the intentions of the approaching person, step on the gas and have somewhere to go. 3rd: Keep your purse and your defense weapon nearby—whether that is an Asp, red-dyed pepper spray, or my defense of choice—a firearm. In the truck, I have a firearm just under the dash in a holster that I can easily and discreetly grab if I am held up at gun point. Under many circumstances I also have a gun on my person in the event I’m grabbed just prior to getting into the car or getting out of it. The truth be told, a firearm on the person of a competent individual is the safest and the most effective place it can be. 4th: Always park your vehicle in a well lit area. When I’m in a parking lot, I don’t necessarily look for a spot closest to the door. I look for a spot that’s well lit, first and foremost. Worst case scenario, use a bright flashlight attachment on your key ring as well. 5th: Look around before you get in your car and before you get out of your car. Your errands are never so important that you don’t have three seconds to evaluate your surroundings. 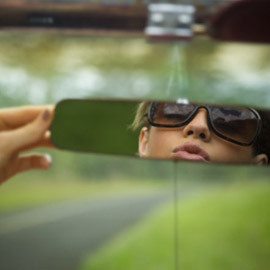 I always look in my rearview mirror and in my two side mirrors before I exit my car. And I always look around me as I walk to my car as well. Even if I’m only taking out 2 light grocery bags, I still use the shopping cart in order that my hands are “free” to pull my gun if necessary (or your Asp, pepper spray, mace, or panic button). 6th: Always have your cell phone handy. You should have 9-1-1 on a one button speed dial on your phone. Don’t rely on your fine motor skills to dial in the midst of an emergency—even if you think it’s only 3 numbers. Also, make your vocal concerns well heard by everyone around you. Screaming can easily be misconstrued in today’s society. So use words instead. “Get away from my car. Help, he’s beating me!”—even if such is not the case. These words are perfectly permissible even if you are under threat of such. 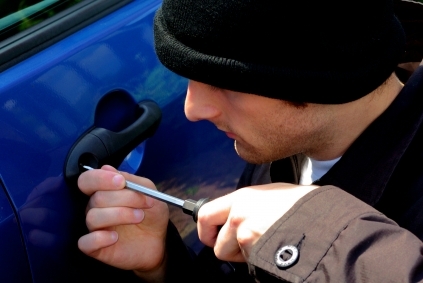 Lastly, be sure you lock your doors as soon as you get in the car and that YOU control when your doors are unlocked when you park the car. Don’t have your car’s automatic settings to unlock the doors when you put the car in park. 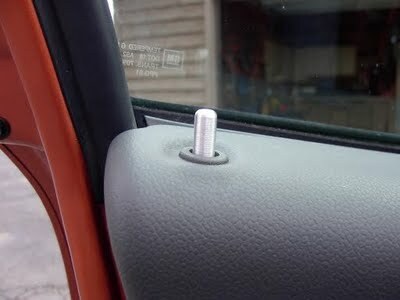 There are many criminals that are familiar with this feature and will use it to their advantage. They will also use the innocence of children in the back seat who may eagerly open their own car door to their advantage as well. Program your locks so that the kids get out only after you’ve given the all clear. And be sure that your children get into the car under your watchful eye before you reenter the vehicle. A little awareness goes a long ways, folks. In fact, just approaching your car with more awareness will be obvious to a perpetrator and thus you are less likely to be the victim of a crime. Perpetrators are lazy. They go for the easy strike. Make sure you don’t portray yourself as “easy” and you’ve one half of the real-life battle that plagues over 2,700 persons per day. I recommend that you carry a long distance spraying red-dyed pepper spray. This will "mark" the perpetrator for at least two weeks. They will not be able to wash it off. I personally have 4 different weapons of self-defense on me at all times in case I am unable to use the most effective one...ahem... My firearm is my first go to. That's how it should be if you are going to use it properly and train your brain properly. You don't have time to figure out which weapon you are going to use. Pick one. Practice. And train your brain. Connie, so glad you liked the webinar! Take care. I'll be forwarding this to my daughter, and daughter in-law. Hopefully this will work better than my reminding them often. I scan police frequencies and listen to alot of dropped '911' calls from cell phones. Accidental 9-1-1 calls from cell phones can take vital resources away from actual 9-1-1 calls. These accidental calls can occur when you pre-program your phone and bump the speed dial button or you bump the "9" against yourself, your belt or something in your purse. Check to see how sensitive your cell phone is and make sure you're one that is creating this problem. If you accidentally call 9-1-1, don't hang up, but let dispatch know it was an accident. When your phone activates 9-1-1 your phone shows up at a dispatch center as either a phase I or phase II cell phone. This can be another 'life-saver' for you if you are in a situation and need help but can't call. Phase I cells require your service provider to pinpoint your location to the nearest cell tower. Phase II phones can triangulate your exact location through gps lat/lon on a map. There are still gaps in this system. This was phased in five years ago so if you don't get a new cell phone every year, check with your cell provider to find out what type of phone you have. If you don't have phase II inplace in your community you can request that your provider implement this or file a complaint with the FCC.